The ginkgo tree, or Ginkgo Biloba, is a spectacular living fossil, dating back some 250~300 million years with sadly no remaining relatives in it's family. It's a native of China but was introduced to Japan approximately 400 years ago and is planted widely in temples and gardens across the country. It's also tough as old boots with a number surviving the Hiroshima bombing, roasted but alive. It's also known as the Maidenhair Tree for the incredible colour its leaves turn in early December. The weather at this time of year can be unpredictable so the leaves stay on for a up to two weeks but rain with bring this to an early close. 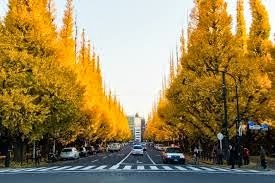 And a two minute walk from Aoyama 1-chome station you'll find one of the autumn's wonders of Tokyo. 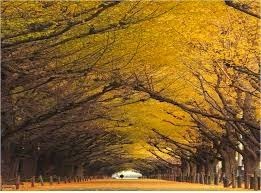 146 majestic trees together forming the spectacular Ginkgo Avenue.